SiriusXM Marine is graphical weather and fishing information for boaters. Essential information like weather radar, NEXRAD storm cell tracking, tropical storm tracks and localized forecasts are all easily viewable inside the LightHouse 3 chart application. Fisherman can enjoy expanded information including high-resolution coastal and offshore sea surface temperature overlays, also displayed right on the live navigation chart. The Raymarine SR200 InfoLINK receiver brings subscription-based SiriusXM Marine weather and satellite radio to your Raymarine LightHouse 3 multifunction displays. The SR200 InfoLINK receiver can also provide access to over 150 channels of SiriusXM Satellite Radio programming including commercial-free music, sports, talk, entertainment, politics, comedy, religion, news and much more. The SR200 features an analog line output connection that you can easily connect to the auxiliary input on most marine stereo systems. SiriusXM channel selection, presets and controls are accessed from Raymarine’s LightHouse 3 SiriusXM app. Super-compact and simple to install, the SR200 connects to the RayNet high speed Ethernet network and seamlessly delivers content to all your multifunction displays. A low-profile Shakespeare SRA-50 SiriusXM Marine antenna kit is included. The antenna can be surface mounted on any horizontal surface with a clear view of the sky, or pole mounted with the included threaded adapter. SiriusXM Marine service is available in the continental United States, southern Canada and coastal waters up to 200 NM offshore. The SR200 InfoLINK receiver requires a valid activation and subscription to SiriusXM Marine Weather and/or SiriusXM Satellite radio, sold separately. Please visit www.siriusxm.com/marine for full details on features, packages, pricing and for the most up-to-date satellite coverage map. SiriusXM's NEXRad Dopper Weather Radar gives you live, up-to-the minute views of severe weather right on your Raymarine multifunction display. Thunderstorms, rain squalls and more are rendered in full-color with embedded information to show you the cell's direction and speed of movement, and intensity. Weather radar can be shown in a seperate window alongside features like chartplotter, fishfinder and navigational radar, or you can overlay the weather radar on your navigation chart which shows you exactly how the weather is going to impact your route. Weather radar can be configured to show you the latest snapshot, or you can animate previous history to help visualize the direction of movement. You can also add additional layers to the display to show cell speed and direction, lightning strikes, and thunderstorm echo-top altitude. Boaters in the Great Lakes, Northeast and Northwest will also appreciate access to doppler weather radar from Canada too. Fishermen in-the-know never go offshore without first checking the weather conditions, including ocean temperatures. The SiriusXM Marine Weather SST layer clearly shows your the ocean surface temparature and helps you to readily identify temperature breaks, pockets, and upwelling. This allows you to find the fish faster, and burn less fuel by bypassing unproductive areas where fish are unlikely to be. The SST layer is fully color-coded for easy visualization of ocean conditions. The chart is also queryable using the cursor or touchscreen. Simply touch anywhere on the chart to see the exact water temperature, wave height, wind speed and direction, and more. The SiriusXM Marine Weather system delivers the latest surface pressure charts right to your boat, automatically. Centers of high and low pressure, fronts, and key isobars are displayed with easy-to-read graphics. Charts can be configured to show the latest data, or to animate historical data along with predictions for the future. Wind barbs or scaled vectors can also be displayed as a layer on the chart. Like the surface pressure layer you can animate the wind chart to see changes over time and anticipate future conditions. The SiriusXM Marine Weather Storm Tracker displays the most up-to-the minute data on the position of hurricanes, tropical storms and typhoons. The storms historical track is plotted along with its current position and the projected cone of uncertainty. With Storm Track its easy to see the approach of bad weather from thousands of mile away and make adjustments to route around it, or seek a safe harbor. Thanks to the convergence of SiriusXM Marine Weather data with the live postion feed from your Raymarine chartplotter, you'll never be surprised by severe weather again. The system continuously monitors for severe weather alerts for your location, and notifies you immediately with both audio and on-screen alerts when bad weather is approaching. Tornadoes, water-spouts, hurricanes, thunderstorms and more are all cause for watchbox alerts. Should an alert be sounded in your area you will know immediately, and will have instant access to the full advisory from the National Weather Service or National Hurricane Center. 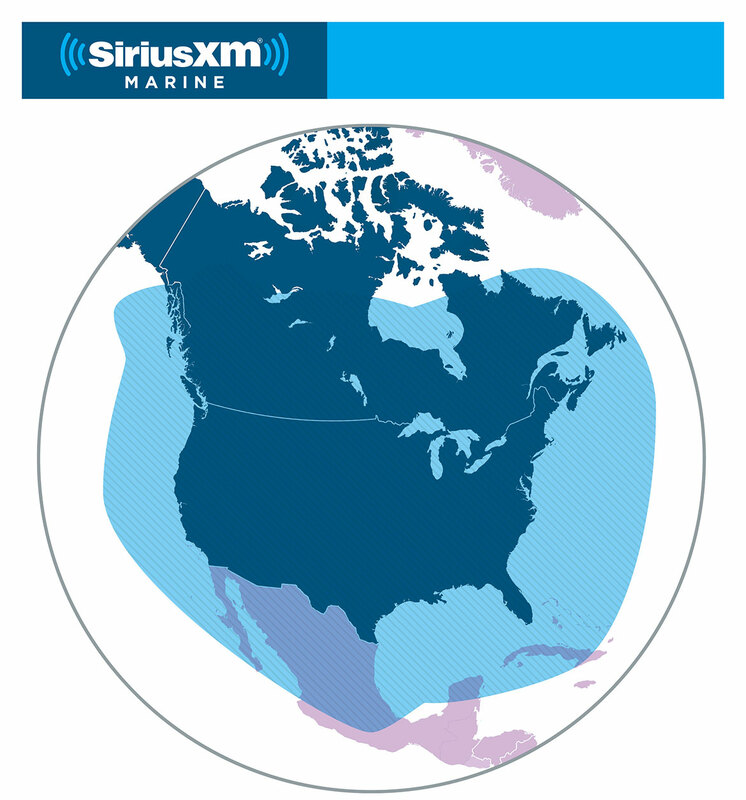 SiriusXM Marine Weather delivers detailed weather forecasts for the continental United States and surrounding waters. With a few simple touches you can see the weather forecast for your exact postion, or anywhere else in the Sirius coverage area. In addition to local forecasts you can also access localized marine warnings, local and national watchbox warnings and the latest tropical statements from the National Hurricane Center. SiriusXM Marine Weather brings you the latest conditions from thousands of land-based and sea-based surface obversation stations, fixed structures, and floating offshore weather bouys. Observation stations can be easily shown or hidden from view, and accessed with a simple touch of your finger or cursor. Thousands of weather observations are accessible including reports on air and sea temperature, wind speed and direction, wave height and period, visibility, atmospheric pressure, trending, and much more! Welcome to the world of Satellite Radio! Activate your SIRIUSXM satellite radio receiver that is built into your Raymarine weather hardware and enjoy channels of whatever you want to listen to. Commercial-free music, all your favorite sports, exclusive talk and entertainment. Not to mention comedy, news, traffic, weather and more. It's all here in one place. Simply line-out to your existing audio system (requires auxiliary input) or amplifier/ speaker system and channel surf directly from your Raymarine MFD. SiriusXM® Marine weather service is available in the continental United States and its coastal waters as well as Southern Canada. This map is an approximation of coverage for SiriusXM Marine service and does not identify actual service levels. Satellite signal strength at border regions may be limited. View the coverage area, or Download and Print for your reference. Q. What models of Raymarine Displays are the SR200 compatible with? Any Axiom, Axiom Pro or Axiom XL MFD running LightHouse 3 v3.9 software or later. Q. Can I control the SR200 SiriusXM Satellite Radio audio channels using the Axiom, Axiom Pro and Axiom XL? Q. Is the SR200 supplied with an antenna? Yes. A Shakespeare SRA-50 SiriusXM antenna with 25ft cable is included with the SR200. Q. I’m replacing a SR100/ SR150 with the SR200. Can I reuse any of the equipment? You can use the existing antenna and the antenna cable. Q. Does the SR200 buffer/store received messages? No. Any data is stored by the MFD, not the receiver. The SR200 does not buffer or store any weather information. When the SR200 is turned on, the unit will send updated weather information to the MFD as it is received. Q. How often do the weather data elements update? For high priority weather elements like precipitation and storm information updates occur every 4 to 6 minutes. Lower priority weather elements, update at different intervals from 15 to 60 minutes. Q. What comes in the box? The SR200 is supplied with an antenna with 25ft of cable, power cable, network and audio cables and owner’s manual. Q. Where should the antenna be installed? For optimal performance, the antenna should be located where it has an unobstructed view of the sky. Q. What weather subscriptions are currently available for the SR200? The capabilities of both units are currently the same. However, the SR200 will be able to accept new data features as they become available. Also, the SR200 is a better value, in addition to being lower in price, it includes the antenna. Q. Is there a free trial of SiriusXM Marine services? Yes, many Raymarine dealers can provide a free trial. You can also contact Marine.Support@siriusxm.com for further information about trials. Q. I’m interested in SiriusXM’s Marine weather, can you provide some additional reference? Please visit SiriusXM’s Marine youtube channel, you can also contact: Marine.Support@siriusxm.com with any questions you may have. Q. If I have any question regarding on SR200’s SiriusXM Marine and music package, who from SiriusXM shall I contact? Q. What type of information can I expect to see once the SR200 has been installed and activated? Click here to see some of the data the SR200 provides. Get a $100 Mail-in Rebate and Your First 2-months free from SiriusXM! Purchase any new eligible marine receiver between January 1 and December 31, 2019, activate it with any SiriusXM Marine Weather Package by December 31, 2019 (see Details on Rebate form), maintain 60 days of continuous paid service, and receive a $100 SiriusXM Rewards Visa® Prepaid Card. Once you install your new receiver, call 1-877-283-6541 and ask for your "2-month marine trial"! See Rebate Offer Details at www.siriusxm.com/MarineRebate.